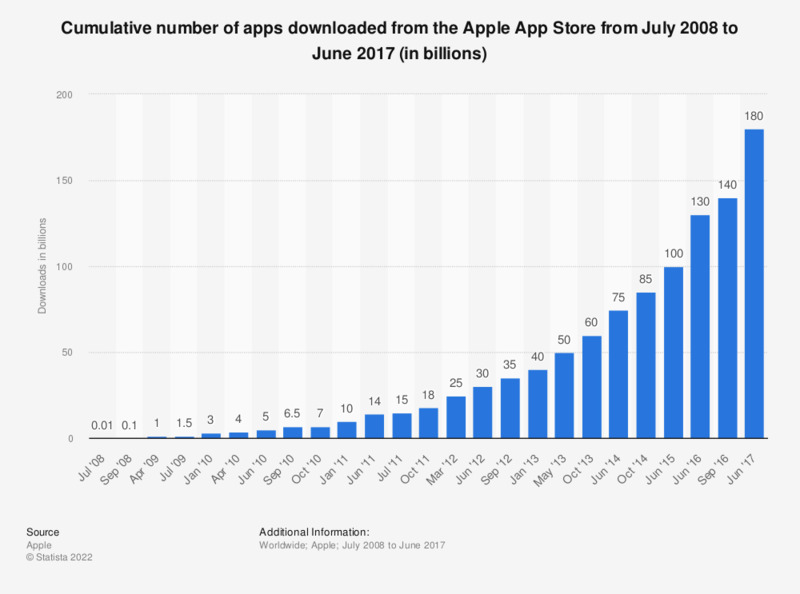 This statistic shows the number of cumulative app downloads from Apple's App Store from July 2008 to June 2017. As of the last reported period, Apple announced that 180 billion apps had been downloaded from its App Store. Apple App Store was created in 2008 and, since then, the number of available apps has been consistently increasing over the years. In March of 2010, there were 150 thousand available apps in the App Store. The number of available apps reached 1.5 million by June 2015, 10 times more than the early 2010 number. This figure includes 1 million native iPad apps. The growth in number of apps available is directly related to the number of applications for the release of newly developed apps. In May 2016, the number of applications submitted for release to the App Store surpassed 50,000 for the first time. This figure included gaming apps, which account for about half of the release applications. Regarding availability, the most popular Apple App Store category is gaming with about 23 percent of available apps belonging to this category. Other leading app categories based on terms of availability are business apps, education apps, lifestyle apps and entertainment apps. Gaming leads in terms of downloads as well. In the ephemeral world of apps, downloads do not equal retention. It is estimated that 25 percent apps downloaded by mobile app users worldwide were only used once during the first six months of ownership. Previous figures are based on official Apple announcements and press releases.